Have you ever slept beside the street in Manila? However I saw the society of the street venders, have chances to communicate those people who was running the business on the street as spending full day there. I joined one of my friend, farmers family came from their province, laguna with their products, vegetables and fruits, crammed into their jeep. Once they arrived manila, keep selling untill sold out, get money to live. It had taken about 5 days. While they left their home, children looked after their home, took care younger sister and domestic animals like their parents did. ﻿During those camping days on the street in Manila, we cooked with fire made by wood around the place. As for water, off course the place was no tap of it, we always brought the big size bottles to the neighborhood building's outside tap. The life style of camping is not easy, not so comfortable especially street in manila. However I learned how to sell the vegetables, cut the pine for good to selling, script of the conversation of between the vender and customer. Also learned how to manage tools even if not so clean and safe place, adjust myself for those inconvenient life. Sometime I miss the camping life in Manila, because it was full of amazing, to survive. Wow, at long last, an entry in English that I can understand. Reading your entry about camp life has made me smile both out of nostalgia and of irony. 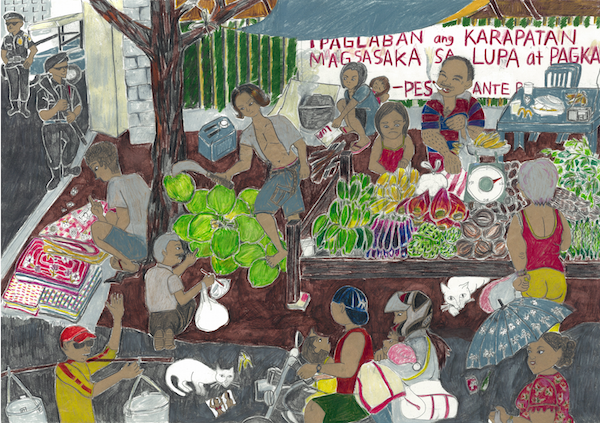 What amazes me is that it has taken a non-Filipino to make me better understand the crippling effects of poverty among the marginalized sectors of my society. Prior to meeting you and being acquainted to the PESANTE farmers, all I knew about poverty and its effects were only but theoretical. I know what it means to be poor, but only afte interacting with the people in the camp have I understood the grim reality of being really, really poor as an individual. Thank you very much, Semba-san, for being one with the landless farmers in fighting for their cause. Thank you for trying to put yourself in their shoes by means of your self-decided immersion stint. Basta, salamat ng marami sa di intensiyonal na pagsasampal mo sa akin sa katotohanang napaka-selfish ko na tao noon dahil sa kawalan ko ng pakialam at direktang pakikiisa sa mga kapos-palad na nakikipaglaban para sa kanilang mga karapatan. Salamat. your fairly observation always helped me to consider the situations from various angles. I do think other site owners ought to consider this website being an design quite clean and amazing design and style, as well as the content. You’re a specialist in this region! Could you give me detail via direct message"contact", with your email address? If you have some suggestion for me. Happy to determine that site is effective on my small iphone 3gs , almost everything I wish to accomplish will be practical. Many thanks for keeping it currently with all the most up-to-date. Needed to compose you that very small observation to be able to say thank you again just for the great tips you have contributed on this website. It's quite extremely open-handed with people like you to supply publicly precisely what many individuals might have offered for an e-book in making some profit for their own end, primarily seeing that you might well have tried it in the event you wanted. These basics also worked to provide a good way to recognize that other people have a similar passion the same as my very own to see more and more when it comes to this matter. Certainly there are thousands of more fun opportunities ahead for many who check out your blog post. I just shared this upon Twitter! My friends will definitely want it!